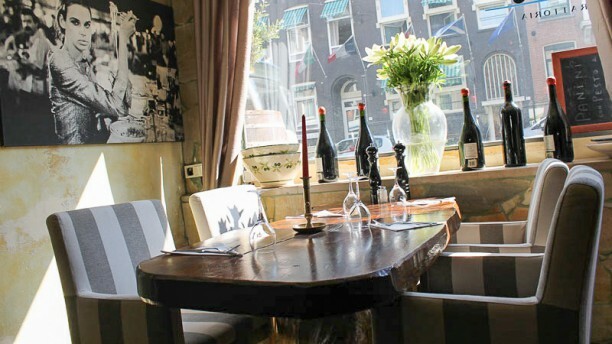 This wonderful Italian restaurant is situated at walking distance from the Vondelpark. The homey atmosphere, cosy design and naturally the delicious food, everything oozes Italy in this place. Don't forget to ask the waiting staff for a wonderful wine pairing, you won't regret it! This restaurant is also great for a wonderful lunch, come and be pampered in an Italian way. a real cozy italian restaurant with all the fancy of chef Antonio that from years cook with passion and make you feel at home, service fast with our funny and charming waiter... absolutely recommended if you are in amsterdam you cannot refuse! Great food and nice Staff ! Great service with lovely food. Highly recommended! We had a wonderfully served delicious dinner at this very nice restaurant with great ambience. Our second time for dining at Toto! We loved the Lasagna and the pasta with mussels, clams, shrimp and fish. Their wine is lovely as well. The waiter is very attentive and does a great job serving the tables. Highly recommend this restaurant for a nice, authentic Italian dinner. Dessert was nice as well. We really enjoyed nice food and atmosphere. The food was really great, esp. the pasta with lobster, I couldn't recall the full dish name. The pasta sauce was tomato based flavor with a little bit sour and sweet mixed with salty. The staff were so friendly and attentive. My husband ate the lobster with his bare hands and the staff was so nice to remind him to use the tools. Haha, so funny. All in all, it's not a big or fancy restaurant, but if you look for something warm and cozy, there it is, just go for it! A wonderful little neighborhood cafe. Nice cozy place with excellent food and friendly service! I'm italian; I don't live in Amsterdam but in London and as Italian who lives abroad I can simply say that this place is what you need to feel the taste of home. Great evening made even better when a group of 19 turned up who were a choir on holiday. starters were quite good, unfortunately i cannot say the same about the pastas. spaghetti with clams made with cherry tomatoes is kind of a sacrilege and tagliolini with lobster were quite tasteless.Nothing special like most of Italian place in Amsterdam. Caprese salad was excellent, very fresh and delicious. Good pasta and grilled salmon. Small , pleasant interior. Good value. Great food made with the best ingredients for fabulous taste! An absolute charm! The food was outstanding, pasta was homemade, sauce was excellent and the dishes variety just right. This restaurant is a real gem. The staff treats you like family! Have been to many Italian restaurants around the world and this one is one of the best! I ordered basic dishes and they were each pretty unimpressive and low on the flavor scale. The service was the most disappointing.